Fake news and virtual reality – You can lie to my face, you can’t lie to my heart, can you? On Monday I went to an in_collusion event which showcased two companies producing works in Virtual Reality, one focused on its use in marketing (Fusion Works), the other uses VR to make art (Marshmallow Laser Feast). The presentations were excellent and the demonstrations of the technology were a lot of fun, but I left feeling equally thrilled and terrified. In a world where people seem increasingly unable to tell the difference between fact, opinion, belief, biased news, erroneous news, propaganda, and downright lies in the form of flat websites and screens, how easy will it be to manipulate people through VR? The fake news debate is not new. Back in the 80s and 90s, we had biased media that worked to its own agenda, and information professionals worried about objectivity in terms of finding reliable sources, taking a neutral standpoint, and understanding statistics. Politics has always been a propaganda game, and those who were interested in objectivity attempted to achieve balance by presenting “both sides of the story”. The BBC was well funded and was required to be “unbiased” in that it could not be seen to be promoting one political party more than another. However, it could only be unbiased within the range of mainstream political viewpoints, and that was based on the assumption that views that stood outside the political mainstream did not need to be represented. In order to be part of the social consensus, a viewpoint needed some kind of representation within the existing political framework. I don’t remember much coverage of the Monster Raving Loony Party, but they were included enough that I have heard of them. Mainstream media biases were reasonably transparent – The Telegraph and The Times were right-wing, The Mirror was left-wing. The Labour Party stood on the left, the Tories on the right, the Liberals of various forms stood in the middle. Arguments over whether the BBC was biased focused on whether one party was getting more airtime than another. It was up to the opposition to provide counter-arguments to the party in power, and “neutrality” was achieved adversarially. However, it was also pretty clear that “establishment” media did not venture far to the left or right of these parties, these were the parties that were getting the majority of votes, and so the debate about bias largely operated within this range. There was little coverage of non-establishment viewpoints, and those publications were easily distinguished from the mainstream, largely because you could tell they didn’t have much money. Anarchist or neo-nazi or new age or other “fringe group” newsletters were obviously photocopied. Special interest news published by charities might have higher production standards, but tended to be associated directly with the group funding the publication and clearly branded because they wanted everyone to know who they were – Greenpeace for environmentalist news, for example, or Amnesty International for human rights coverage. In other words, you only had to look at the publication to be able to tell where its biases were likely to be. All that glitters on line is gold? Those affordances started to disappear with the advent of the web, and its “democratization” of the publishing process. I remember discussions about what we could do as Information Professionals to help people tell the difference between “mainstream” and “alternative” websites. At first, it did not seem urgent, because “mainstream” organizations with a lot of money were able to build slick, well designed websites, which looked and worked differently to websites that had been hand-crafted by individuals. With the rise of high quality blogging software and falling costs of production technology, that gap has closed, and those differences are far more subtle. “Established” old media, such as local papers, have seen their budgets shrink, while technology has become cheaper, so anyone wanting to build a website from scratch with a limited budget can now produce a site that looks pretty much the same as an “established” one, even without the benefit of a wealthy sponsor. So, now we have satire, websites of “old media” outlets, and new sites that all look almost the same. That’s the equivalent of your local anarchist collective being able to produce a newspaper that looks like Time magazine, and the National Enquirer looking much like The Economist. No wonder people are confused! On top of that, accuracy and fact-checking are both time-consuming and expensive. Social media demands speed above all else. Today’s news becoming tomorrow’s chip wrappers seems like aeons in a world of flickering feeds. In the past, rushing for a scoop often led to inaccuracy, but people would at least browse through an entire paper, allowing time for more reflective articles and analysis. We have also seen a rise in “emotional” reporting. A reasonable desire to allow people to connect emotionally with what was happening to others around the world became the mainstay of 24-hour reporting. When you don’t have time to reflect, you can still grab attention by talking about people’s feelings. Watching “experts” provide reasoned analysis after an event isn’t as thrilling as watching people screaming or crying. On line, every article has to be as appealing as every other. The “stickiness” of sites that was much discussed in the 90s and 00s was essentially an attempt to replicate the behaviour of someone who would buy a paper because of the headline, and then slowly browse the rest of the articles – which was where you tended to find the more slowly produced, reflective content. Now every article has to shout for attention, and we have a clickbait world, where screaming sensationalism and inaccuracy don’t matter, because it’s the volume of clicks that generate the revenue. This is how we got here, now where do we go? As Information Professionals we understand and have long debated the issues, we can understand how we arrived at this point, and we know how to verify and validate. We must educate people to look behind the headlines to the source of the information, to understand who funded the site, and why, who the author was and what biases they are likely to have, how to unpick loaded language and selection bias, and how to understand statistics and the way they can be manipulated. We must encourage reflection, comparison, and understanding of context and intent. Fake news, propaganda, and bias are familiar concepts to us, and yet we still have people claiming to have voted for Brexit because they think the EU banned the re-use of teabags. We have not done well at creating a reflective, media literate, statistically savvy general population, and that is just for flat websites and screens. Virtual Reality is all engrossing, more absorbing than reading, more immersive than cinema, more immediate than television. Whose reality is it anyway? At the moment, the technology is in its infancy, and it is still “obvious” that it is not “IRL” – just as the sources of print media in the 80s and the early web of the 90s were “obvious”. If we haven’t managed to create a media literate population able to distinguish honest reporting and unintentional mistakes from clickbait and propaganda, how are we going to create a VR-literate population able to distinguish the emotional impact of a “virtual” experience from a “real” one? People already tend to trust what they “feel” is right, and “facts” are not persuading them otherwise, as they would rather “trust their own experience”. How are we going to ensure political propaganda doesn’t become so emotionally absorbing that “post truth” is not just about distinguishing fact from fiction, but distinguishing “our own” experiences from virtual ones? Is it enough to know the context and intent of the makers of our virtual experiences? Do we need to teach people to develop “experiential literacy”, and do we need to start developing that very, very soon? Image: Credit: Sean Goldthorpe. 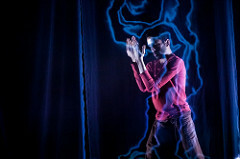 Renowned dancer Aakash Odedra, choreographer Lewis Major and the Ars Electronica Futurelab, staged at the International Dance Festival Birmingham, 2014.